I don’t know if Wayne Horvitz has been trying to solidify his standing as far as the “serious” side of his work goes, and he would probably not be happy if he thought I was calling his earlier work, and the Zony Mash era, not serious. He added a wealth of beauty to his credits with the lovely and inspiring music of his Sweeter Than the Day group. At the time, it was the perfect complement to the funk of Zony Mash and the avant-gardiness of his Gravitas ensemble. In this new album, he has combined Sweeter Than the Day and Gravitas into an extraordinary synthesis of pure brilliant Horvitiziana. 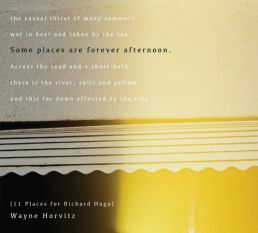 The album, Some Places are Forever Afternoon (11 Places for Richard Hugo), is inspired by, and is an homage to, Seattle poet Richard Hugo, who died in 1982, but whose voice rings down through the decades. 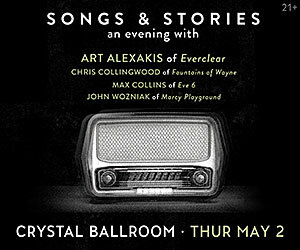 Don’t expect his poetry set to music, or someone reading while the music plays. Horvitz made the decision not to connect the words and music directly, but rather to filter them through the compositions. A wise decision considering the inconsistency of valiant tries like Conjure, which tried to set Ishmael Reed’s words to music…sort of. Horvitz will discuss this further as we get closer to his concert at the Creative Music Guild in an OMN interview on the website and podcast. The musicians are Horvitz on keys, Ron Miles on cornet, Sara Schoenbeck on bassoon, Peggy Lee on cello, Tim Young on guitar, Keith Lowe on bass, and Eric Eagle on drums. You can find the poems the compositions are attached to in the booklet that comes with the album. Be of two minds: listen and read at the same time and discover what an enriching experience you find.